My mother-in-law has a flaw. She thinks about others first. About fifteen years ago, she lost her balance and fell. She broke two vertebrae in her neck. However, she didn’t want Ed’s dad to call Ed for a few days, since he had plans for the weekend. She didn’t want to cause a fuss, and make Ed cancel his plans. Ed was chaperoning a lock-in for the youth group at our church, and it would have been easy to find a replacement for him. 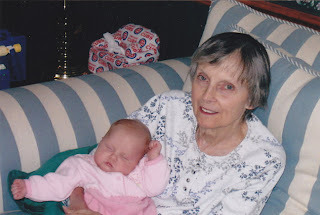 When I was planning my wedding, her granddaughter, my soon-to-be niece, was eight years old. She was going to be our flower girl; she had always wanted to be the flower girl in her uncle’s wedding. As all little girls do, she wanted to be sparkly. I didn’t want her to be sparkly. I picked out her dress, and it matched my wedding dress perfectly. Well, my niece didn’t like it. So we went from dress shop to dress shop, trying to find a dress that maybe she would like. My mother-in-law defended my choice, and insisted that my niece wear what I had chosen. She got to wear a sparkly dress for Christmas, instead. I was very lucky to have my mother-in-law as my mother-in-law. All week, it has been difficult to substitute past verbs for present verbs. “She has”…to “she had”, and so on. You see, today we are going to celebrate her life. We are going to remember the twinkle she always had in her eye, the dry wit she displayed even when she was in pain, the smile she always had for her grandchildren. I all my days could gladly spend!